We spend an inordinate amount of time talking about air in the tires. Why, how much, how often, and how to. We do this because, just when we think we have comprehensively covered this topic, we see people riding around on tires as soft as a stomach-sleeper's pillow. Putting air in your bicycle's tires will (1) keep them from getting pinch flats (which should be the only reason anyone would need), (2) help you travel faster and more efficiently, and (3) not seem very hard, or take a long time, once you know how to do it. We believe there are four basic reasons people fail to regularly fill up their tires. Not knowing that tires need filling in the first place. Not having the right tool for the job. Not knowing how to do it. Let's address these reasons one by one. You know a flat tire when you see one, but do your tires really need more air if they appear nice and round? Quite possibly. 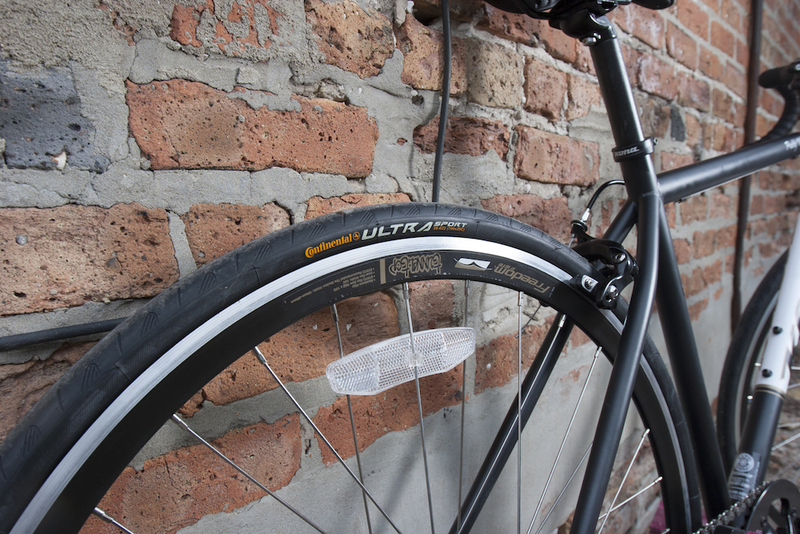 Bicycle tires lose a little air all the time, whether you are riding your bike or not. How often you need to refill is mostly dependent on the type of tire, and the optimal recommended pressure. The correct pressure is embossed on the side of the tire and expressed as a range in units of PSI (pounds per square inch), for example 65-95psi. You should aim to keep your tires closer to the higher number. If the pressure approaches or falls below the lower number, it's time to refill. You can determine the pressure in your tires by using a tire gauge, or by feel. We strongly recommend you get a gauge (or a bicycle pump equipped with one) if your bike sports skinny, high-pressure tires. With such tires, it is nearly impossible to estimate the correct inflation. Most other tires should feel good and firm when you apply strong pressure to the tire with the heel of your hand. When you sit on the bike, the tire should hold its shape, with only the smallest hint of a bulge at the point of contact with the ground. Any softer, and it's time to refill. If you do not have a bicycle pump, you can borrow your neighbor's, take your bike somewhere that has free air (like Cosmic Bikes, if you are on the northwest side of Chicago, or your own friendly neighborhood bike shop), or paid air (like a gas station), or, for less than fifty bucks, you can get a pump! We recommend a bicycle-specific floor pump with a built-in pressure gauge. Once you have a bicycle pump, keep it in a consistent location, preferably near where you usually store your bicycle. In addition to being much more efficient, this is another advantage of a floor pump over a portable pump that can travel with you from one place to another, until you forget where you left it. If you do not like using your pump, it could be because you haven't learned how (if that's the case, see below), or that the pump you have isn't right for your needs. A small emergency pump is exactly that. It's designed to be very portable and used while far away from home. A pump with a nozzle that requires the use of three hands is also less than ideal. For regular at-home maintenance, we recommend a floor pump with a universal-fit head that is easy to apply to the valve, and stays on securely while air is being pumped. This is nothing to be ashamed of. Millions of people just like you, regardless of political affiliation, age, gender or other factors, know nothing at all about putting air in bicycle tires. Hence, the need for this blog post. Our bike shop, and most other service-focused establishments, would be delighted to offer you a quick hands-on demonstration (though perhaps not during peak traffic hours mid-summer; aim for first thing in the morning instead). Here is information on the two types of common bicycle valves. Once you have read this, your weird valves will seem like old friends. BTW, most bicycle-specific pumps already know there are two different types of valves, and can handle either without difficulty. Position your bike so it is stable (use a kickstand, a wall or a friend), and rotate the wheel so that the valve is up off the ground. Remove the valve cap. If you have Presta valves (see above), make sure the valve is OPEN before applying the pump nozzle. Secure the nozzle around the valve (usually by flipping out the lever at the pump nozzle so that it's roughly perpendicular to the nozzle) and begin pumping. If you encounter a lot of resistance, the pump head is not on properly. Remove it from the valve, reposition and try again. Fill up to recommended pressure (embossed on the sidewall of the tire). We sympathize completely. We've all had these feelings before. But ask yourself, is it worth getting a flat? No, it is not. So just do it. Do it now.